Now if only somebody could figure out that the series has more characters than just Megaman/X and Zero. It doesn't reflect well on the Japanese when KidRobot has more sense marketing Megaman than they do. Protodude pls delete the comment above. Total misread my reply 2 minutes ago. I agree, I really want to see some Star Force, Battle Network, Legends, and ZX down the line. Pretty damn cool for the price, wasn't originally planning on grabbing these but now considering. Love the backdrop stands. That looks pretty cool. It's too bad they aren't articulate. These are really cute, I've been waiting to find out the release date since i first saw them. It's a shame they are not articulated, but they're still nice. 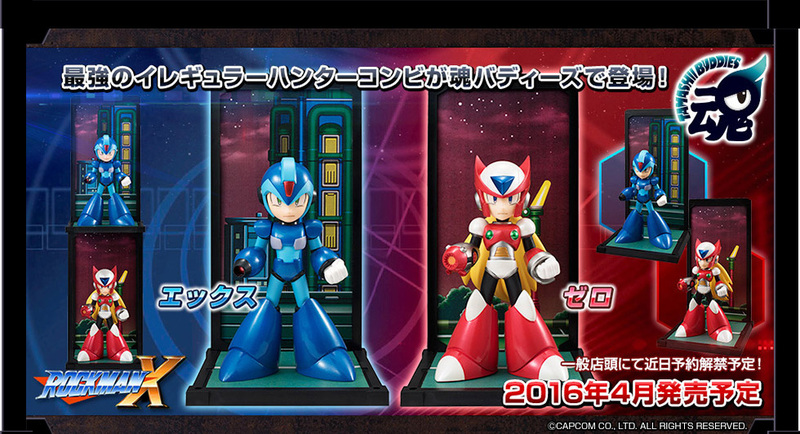 I also agree with the sentiment that X and Zero seem to be the only characters to get Megaman figure love lately. It would be good to see someone else soon! These versions of the characters are adorable, I really wouldn't mind getting either of them. I really like how they try to invoke that X1 feel with the backgrounds, yet somehow it doesn't come off as tacky. I wouldn't mind a few more characters, like Sigma, Aile, Iris, Roll, Tiesel, etc., but since those guys don't get many figures in general, it probably won't be happening soon. Not just characters from other series but these "toy" makers haven't even scratched the surface as far as the Classic and X series go..
We never got a D-Arts Proto Man.. yet we got Bass. And even tho I'm not a fan of Axl, no Axl. Iris would be cool. X's other armors.. I'd love to get one of X2's Giga armor. 1 or 2 popular robot masters and mavericks would be nice. So many possibilities they haven't touched on. It's a bloody miracle that we got Vile.